Racing and touring is hard on liners. Sweat builds up; articulation causes chaffing. Replace your SCARPA boot liners with a fresh pair, listed below by model. Alien 1.0 - Intuition Light liner is as snug as a sock. In fact, you have to put it on before putting on the shell. Moldable, but thin so you won’t get too much extra room. Alien - Also an Intuition liner designed specifically for the 0.0 version. Fully heat moldable and has a tongue for easy entry. Velcro closure at the top keeps it tight. Cross Fit Tour - Direct replacement for the Alien RS stock liner. 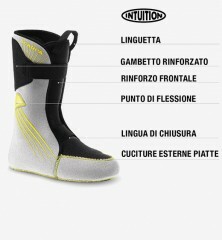 Like all SCARPA liners, made with high-quality Intuition foam. Pro Flex G - SCARPA's most popular liner, designed for the Maestrale boot. Thick, cozy, and fully moldable. Men's and women's versions available, with the latter have a slightly lower calf. I'm looking for an Alien RS liner in a 29, will you be getting any of these in or can you special order for me? Hi Chris, we do not have any on order. We can look into special ordering them for you if Scarpa has some in stock. I have a pair of Scarpa Alien RS size 30 boots. Seeing as how Scarpa doesn't seem to be offering a replacement stock liner yet, how would the Alien liner you sell compare in size 30? Hey Troy! The Palau Tour Lite Performance is probably your best bet for a similar liner at this point. Which liner and size liner would work best to replace a Dynafit "one" boot liner 28/28.5 shell. Hey Bill! I think that this liner in a 28.5 is probably the better choice as a "direct" replacement, but if you are looking to customize the fit a bit there are other options. This liner might work but my concern is that it'd be a bit too thin unless the previous liner was way too tight until it packed out. This one could be a good choice as well and could likely improve skiability. 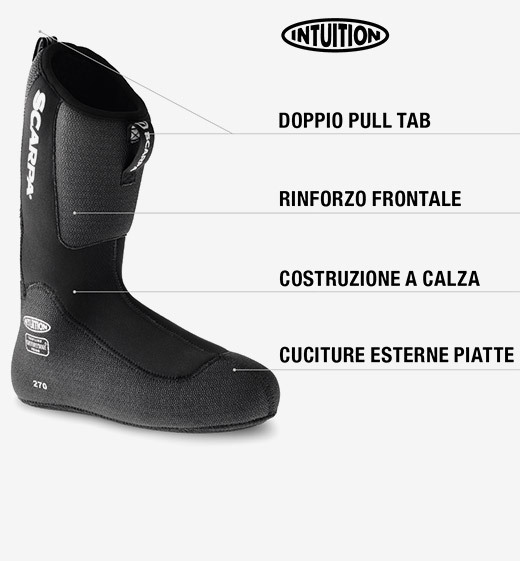 Would these liners work for old Scarpa T1 tele boots? If not, can you get some? Hi Kurt, these liners will work in your T1. You just want to ensure that when you mold the liner you flex the toe bellows a couple times to ensure that you create the flex zone in the toe of the liner. Size 26: How high?, thickness in mm., Stiffness: S,M, H? Hey Mike! I'm definitely not the leading authority on the T-2 as we've never stocked it so bear with me. Overall I think the Pro Flex G is probably a pretty similar liner to what your T-2 had in it and probably one of the best replacement liners available. They're fairly stiff (Medium or Medium Hard maybe) and seem to have a pretty tall cuff. 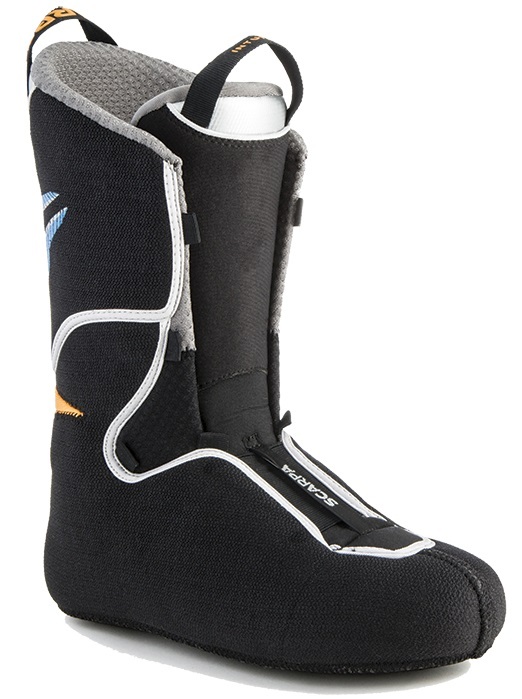 Are there still liners available for older Scarpa Terminator 2 boots? Or should I give up on them and start over. Hi Ivan, there is not. You can always try a Pro Flex or an aftermarket liner such as an Intuition or a Palau. Visit our boot fitter for a specific recommendation based on your fit. wil pro flex G fit in my Scarpa T2X? Thanks!! Hi Jeff, the likely answer is "yes," but we can't be 100% certain because we do not stock the T2X. Are the Pro Flex G the same as the stock liner that comes with the 2014-2015 Freedom SL? Hey Jonathan! Nope, they're from the Maestrale! They're a bit shorter in the cuff, thinner, and have better walking capabilities, but it comes at the expense of stiffness in ski mode. The Speed Ride Liner is the original Freedom SL liner that you're looking for, but the Intuition Pro Tour is another awesome option to consider, especially if you spend a bunch of time skinning in those boots. Another question. How does the "Scarpa" Proflex-G differ from the Intuition Pro-Tour? Eric-Depends on which liner you choose. The pro-tour medium volume and low volume are different thicknesses. Both the pro-tours will have a stiffer cuff than the proflex-g and will add some support to the boots. The proflex-g has a thinner toe area but probably the thickest cuff of the three liners. Otherwise the Low volume pro-tour is the thinnest liner of the 3 overall. Will the size 28.5 Proflex liners fit in my size 28 Dynafit TLT 6? I suspect they will. My very old T2 liners size 28.5 fit my TLT5, size 28.5. Eric- The sizing would be right for your 28 dynafit boots. If it "fits" will depend on the shape of your foot. I was curious if the Alien 1.0 Liner would fit well in a PDG boot, current model year? Hey Aaron, thanks for reaching out! Technically, yes. Realistically, it's tough to say if your foot will work with this combo. How would the Alien liners work with an older version of the Scarpa F1s (the lime green model). Would I be better off with an Intuition Pro-Tour? Hi Luke, it depends on your fit. The Alien liners are a lot thinner so if you didn't have much room in the shell they would work great. The Pro-Tours are thicker, heavier, and don't articulate as well. How does the Pro Flex G liner compare to the Pro Flex Evo that comes with the F1? Hi Patrick, the Pro Flex G is a bit stiffer and about an ounce heavier . Also a slightly more rigid shin pad and feels a tad thicker throughout. Is it possible to use Alien 1.0 liner in regular Alien boots? I have regular Alien boots, but it's hard for me to find liner for normal Aliens in EU. Hi Aljaz, yes it's possible. Note the 1.0 liner is thinner so there will be more space in the boot which may affect your fit. We should also have more "0.0" liners later this fall. What about going the other way- using the Alien liner to make the Alien 1.0 a little warmer and more mountain-worthy? Hi Alex, yes that is possible if you have a little extra room as the Alien liner is a bit thicker. Do you have liners for the F1s? Hi Patrick, not in stock, I will have to check on availability for you. Ok, thanks! I look forward to hearing if they're available. Hi Patrick, it sounds like there will not be any availability this season, sorry. do you guys sell a liner for an alien 24.0? Hi Rich, we will have a size run of the Alien liners later this fall. Send us an e-mail if you'd like one reserved for you. Hi Anthony, the Alien liners are a bit thicker than the Syborgs, which may be considered an upgrade depending on your perspective. The 1.0s would be a fairly negligible difference.